Las Vegas Blog: Steve Friess' VEGAS HAPPENS HERE: Wynn, Caesars Tchotckes Sales This Weekend! * The Wynn is doing its Wynn Warehouse Fri-Sat 9 am - 6 pm and Sun 11 am - 5 pm in the LaTour Ballroom. You might recall I covered this last year. It's a massive expanse of Wynn-branded stuff of all sorts. 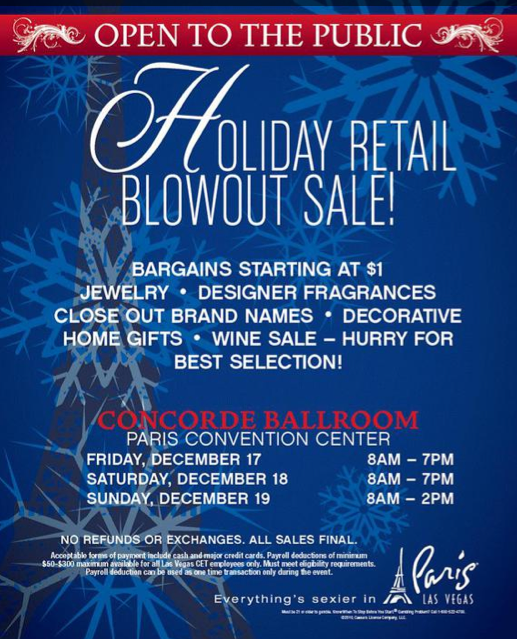 * Paris is hosting the Caesars Entertainment Holiday Retail Blowout Sale, which I also covered last time. This one (see graphic) is in the Concorde Ballroom on Friday and Saturday 8 am - 7 pm and Sunday from 8 am to 2 pm. Again, it's a fantastic opportunity to get Bette Midler ornaments, Harrah's Joliet shotglasses and other odds and ends. Great opportunity, and how nice of them to do them the same weekend conveniently before Christmas. Somebody in our house is getting a Caesars Atlantic City track suit!